Salem, N.Y. June 2, 2004 – The National Elevator Industry, Inc. (NEII), the national trade association of the building transportation industry, has announced its reorganization in an effort to become the leader in promoting safe building transportation. The new NEII will have greater focus on becoming the active voice for the elevator, escalator and moving walk industry, promoting the development of codes and standards that advance safe building transportation for new and existing products and technologies, and working with local government agencies to encourage the enforcement of these practices. With its new, more defined mission statement, NEII will actively work with the code and standard writing community to help develop American Society of Mechanical Engineers (ASME) A17 codes and standards that advance the safety of the riding public and encourage the introduction of new and safe products and technologies. NEII aims to become the liaison for communicating industry information to the media and general public, and for educating the industry and government about issues pertaining to building transportation systems. In conjunction with its reorganization, NEII also has redesigned its Web site (www.neii.org). The new site includes updated, in-depth safety and education information for the riding public, as well as easier-to-use communication tools for its members. 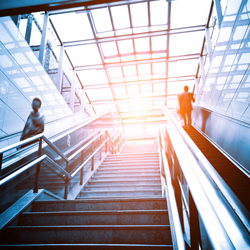 Users can access information about the most recent ASME safety codes and standards, as well as a flash presentation about recent changes made to the ASME Safety Code for Elevators and Escalators, ASME A17.1, aimed to improve rider safety. NEII membership is open to all companies in the business of elevators and escalators, reflecting its commitment to providing opportunities for industry members to become more actively involved in advocacy and leadership. NEII membership offers its affiliates a number of benefits including exclusive access to industry information and discounts on industry-related education materials. For more information on NEII membership, please visit NEII’s Web site at www.neii.org. The National Elevator Industry, Inc., NEII, is a national trade association representing the interests of corporations, firms or companies that, as part of their regular business, provide or perform any of the following: manufacture (including parts or components used by others in the manufacture, repair or maintenance), install, repair and maintain elevators, escalators, moving walks and related equipment. Trust membership is available to those corporations, firms, or companies who, as part of their regular business, employ members of the International Union of Elevator Constructors (IUEC) and contribute to the benefit trusts (Trusts) established by agreements between the IUEC and NEII. NEII’s goal is to become the leader in promoting safe building transportation, as well as working with local government agencies to encourage the adoption and enforcement of the latest codes and standards.